Hurrah! 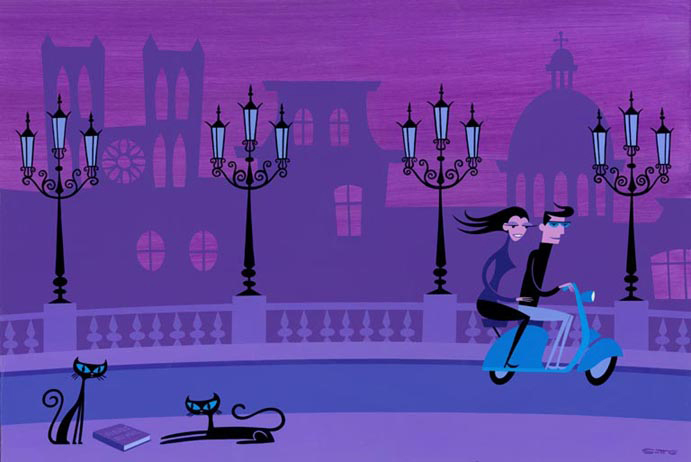 Josh Agle (aka Shag) has made a new illustration with a scooter! It’s called “The Lost Book” and is a 16 color Serigraph. This is signed and numbered edition of 200. So hurry. The print measures 24 X 17.5″ or 61 X 44.5 cm. $225. 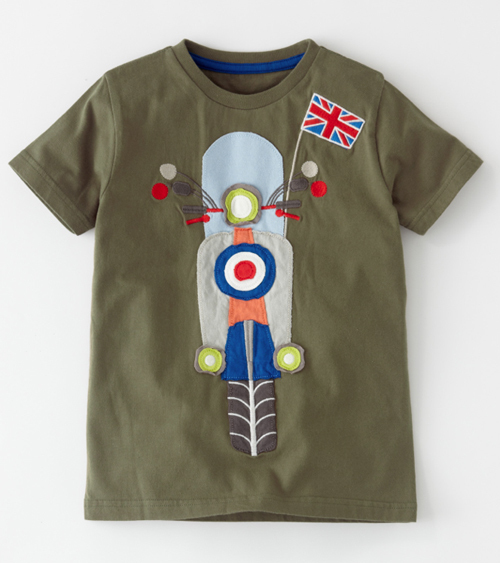 Made up of appliquÃ© and embroidery, this Boden shirt is available in sizes 1.5 years to 12 years old. But sadly not for 45 years old. Boo! 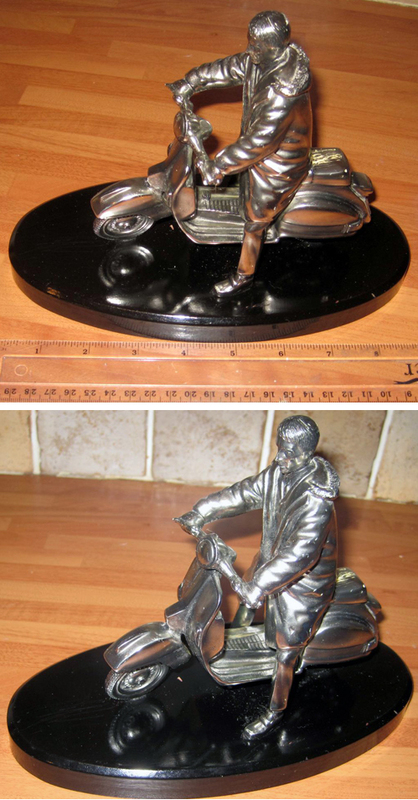 Spotted on eBay recently, this statue was made by the UK giftware and collectibles maker “Leonardo.” Dated 2004, it’s labeled “Silver Dreams” and measures approximately 5 3/4″ tall. All apologies to Depeche Mode. 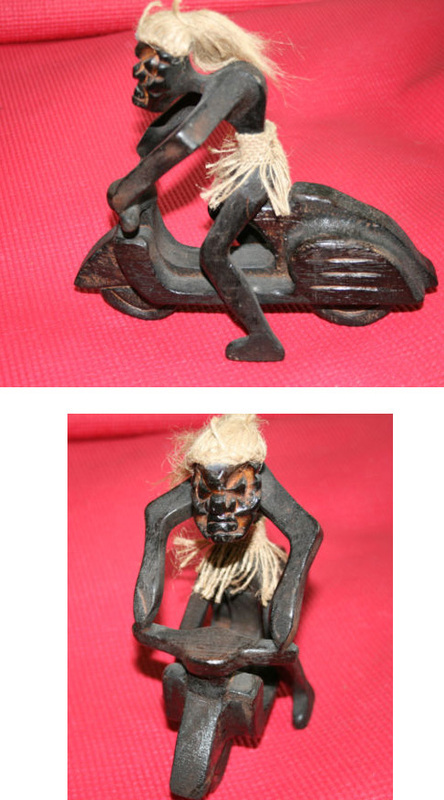 Now we’ve featured tikis riding scooters before in the form of a mug but never actual tiki-tikis. These occasionally pop up on eBay now and then. Any scooter enthusiast who’s also tiki nuts will have to have one. Besides who knows what bad mechanical mojo they may dispel? ScooterSwag featured this fabric last year and ModCloth.com wisely made some fashion out of it. A neat detail is that the scooters are displaying paint jobs of houndstooth, gingham and seersucker patterns. It costs $64.99 and comes in sizes XS-XL and runs small. 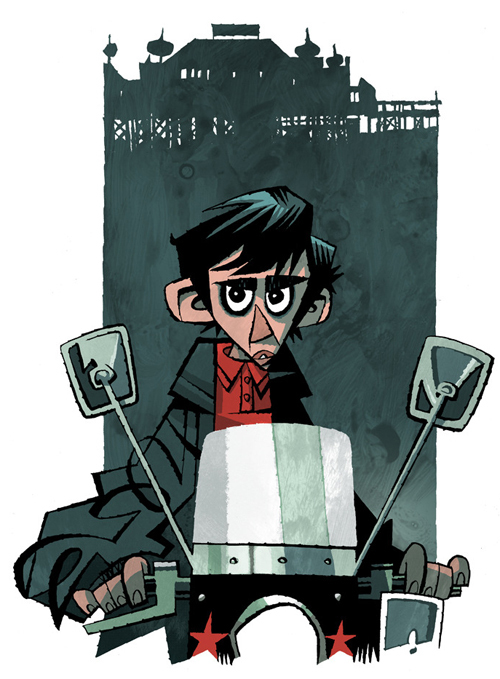 Here’s Jimmy from Quadrophenia as illustrated by the very talented UK artist Jonathan Edwards. You can own this image as a signed and numbered very limited edition print. (There are only 25 being produced.) It comes mailed flat on A3 archival quality matte paper. For us Yanks, that means it measures approximately 16.5 x 11.7 in. Best news of all? It’s only Â£25 which I think is a steal. To order, visit here . To read more about the artist visit here . Here are some new scootery baby clothes from both Baby Gap and Old Navy. First up is a mod number that looks like a top and bottom set but is actually a onesie. It’s 100% cotton and snaps at the shoulder and inseam. Sizes are from newborns to 2 years. It’s $19.95 at Baby Gap. The pink two-piece dog-centric number is also 100% cotton and is now on sale at Old Navy for $10.00 but only the 18-24 mos. size is left. So hurry!